Judicial and law enforcement agencies alike used to, and continue playing a significant role in the redistribution of property in Russia. There are many reasons for that. Above all, it is very tempting to obtain material rewards, benefits and promotions from the "customers" of offenses and crimes. Can we even talk about justice, equality and social and economic development of Russia? One specific example of an explicit violation of Russian Federal Law by the law enforcement agencies was when Volgodonsk Internal Affairs (police) reviewed the pivotal Statement of YACONTO LLC (out. №1-20714 from 14.07.2002) which demanded initiation of a criminal case in respect of the bankruptcy fraud of the defense enterprise Salut JSC (renamed into “Volgodonsk plant of radio-electronic equipment” JSC or VZRTA JSC), seizure of assets owned by YACONTO LLC and huge material damage caused. This Statement has been prepared by General Ivan Poymanov, an ex-Chief of one of Departments of the General Prosecutor’s Office of USSR (now retired), a highly professional and a very principled investigator. According to List of documents №1 to the said Statement, 210 documents on 425 pages and a Reference of YACONTO LLC from 14.07.2002, which described illegal activities of an Organized criminal group (OCG), were attached. Having reviewed the Statement, the DAEC officer (interrogator) of Volgodonsk IA, lieutenant of militia V.V. Bulygin issued a Resolution dated 01.08.2002 “on the appointment of a documentary audit”, approved by the Chief of Volgodonsk IA colonel of militia A.D. Tokarev. That Resolution was faxed to YACONTO LLC on 05.08.2002. In his Notification from 06.08.2002 ref. №8/9153 to YACONTO LLC, A.D. Tokarev officially announced a start of the auditing of economic activity of Salut JSC, in accordance with the Statement of YACONTO LLC. In practice, Volgodonsk police officers never conducted any auditing of Salut JSC or searched for manufacturing equipment owned by YACONTO LLC on the territory of VZRTA JSC whatsoever. In the period of the alleged verification of the facts indicated in the Statement of YACONTO LLC, Volgodonsk police issued only Resolutions of narrative and chronological kind from 02.08.2002, from 04.01.2003, from 07.04.2003 and from 25.06.2003 “not to institute criminal proceedings”, prepared in co-authorship with the very OCG members which were to be checked. But what’s most interesting, is that a Regulation of Prosecutor’s Office of Volgodonsk from 30.12.2002 signed by Deputy Prosecutor V.I. Kozyrev, mentions a strange Resolution “not to institute criminal proceedings” dated 02.08.2002, issued by Volgodonsk police in response to the Statement of YACONTO LLC (№1-20714 from 14.07.2002). This Resolution was unknown to YACONTO LLC and has already been annulled by the Prosecutor’s Office by the time its existence was unveiled. If you compare the two Resolutions of Internal Affairs from 01.08.2002 and from 02.08.2002 (one day difference), and compare two Notifications of Internal Affairs from 06.08.2002 ref. №8/9153 and from 06.08.2002 ref. №8/9155 (issued on the same day), you’ll find that they are totally opposite to one another from the perspective of meaning and content. Moreover, instead of Colonel A.D. Tokarev’s signature on the fake Resolution from 02.08.2002 and fake Notification from 06.08.2008 ref. №8/9155 we find a signature of the same “unknown person”, and instead of DAEC Volgodonsk IA officer’s, lieutenant V.V Bulygin’s signature, both fake documents bear his “modified signature”, certified under a round seal №2. Both falsified documents have been submitted by the Volgodonsk IA (out. №8/1288 from 07.03.2003) to YACONTO LLC after a strong demand was expressed by the latter when the existence of those documents has been “revealed”. It can be stated with confidence that falsified documents with falsified signatures were fabricated several months after the dates they bear. These documents were used by the Volgodonsk IA officers in order to discredit YACONTO LLC and prevent a verification of the facts mentioned in the Statement of YACONTO LLC (out. №1-20714 from 14.07.2002), multiple addendums to it and the documents attached thereto, submitted to Volgodonsk Internal Affairs (police) department. Sequence analysis of the document preparation showed that the Resolution by the police dept dated 02.08.2002, issued on the next day after the first, couldn’t have possibly interposed between the Resolution of Volgodonsk police from 01.08.2002 and its Notification from 06.08.2002 ref. №8/1953. The Resolution from 01.08.2002, faxed to YACONTO LLC on 05.08.2002, was registered by the date of delivery, 05.08.2002. At the same time, Volgodonsk police never mentions its Resolution from 02.08.2002. Besides, the issue of such document should have cancelled the preparation of Notification of IA from 06.08.2002 ref. №8/9153. Of course, coincidences happen, but it’s an interesting fact that the Resolution of Volgodonsk police dept from 01.08.2002 has been signed by the DAEC operative of Volgodonsk police Lieutenant of militia V.V. 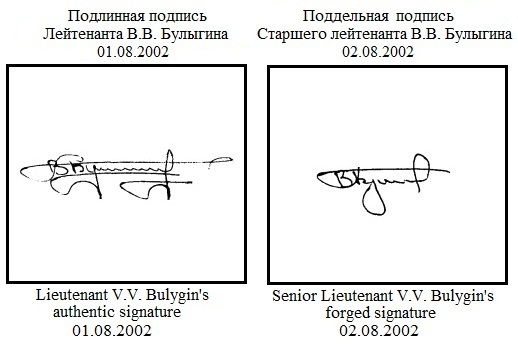 Bulygin, while the Resolution of Volgodonsk police from 02.08.2002 – the one with a falsified signature – has been signed by Senior Lieutenant of militia V.V. Bulygin. The investigation of deliberate bankruptcy of the defense company Salut JSC would have undoubtedly led to the investigation of premeditated bankruptcy of Atommash OJSC, where the same OCG was involved. If the facts in the Statement of YACONTO LLC to the Volgodonsk Internal Affairs (out. №1-20714 from 14.07.2002) and its addendums were proven, they would have become the basis for a major criminal trial in Russia related to the bankruptcies of Salut JSC and Atommash OJSC. And since high-ranking officials at federal and regional level were involved, verification of the facts of criminal activity on the said Statement was unlawfully turned down. It’s not by accident that a very “swift, flexible and executive” young DAEC investigator of Volgodonsk police dept, senior lieutenant of militia V.V. Bulygin, was assigned to investigate the bankruptcy of Atommash OJSC by YACONTO LLC’s appeal, on top and in parallel with the investigation of the bankruptcy of Salut JSC. Presumably, he figured out everything at once (as if it were an ordinary kiosk) and wrote three legally casuistic Resolutions from 03.11.2003, 05.11.2003 and 01.12.2003 of depictive and chronological kind. By doing so, he fully justified the “trust” of his bosses. A similar Resolution of Volgodonsk police dept from 20.02.2004 has been prepared by the investigator (interrogator) of OD DAEC of Volgodonsk police dept, lieutenant of militia V.M. Gubarev. But the leadership of Volgodonsk police dept seemingly didn’t feel it was sufficient, therefore, two more Resolutions, identical nearly as blueprints, from 02.04.2004 and 16.04.2004 have been prepared into the bargain, but this time signed by the OD DAEC investigator (interrogator) lieutenant of militia A.A. Nesterov. The Resolution of Volgodonsk police dept from 16.04.2004 “not to institute criminal proceedings” approved by the Chief of Volgodonsk Internal Affairs (police), colonel of militia V.P. Potapov, as well as the previous ones, contained false and distorted information. It also contained a reference to the inquiry materials and Reference OM-2 of Volgodonsk police dept from 15.04.2004, according to which the documents of Atommash OJSC have been destroyed in accordance with the Order of Russian Ministry of Internal Affairs №615 from 19.11.1996 “due to expiration date”. Those documents were essential for confirming the crimes committed by the members of the organized crime group (OCG), listed in the appeals from YACONTO LLC. It’s a telling fact that an investigation of the biggest anti-state crime in Russia was assigned to young militia trainees, who were backed up by well-trained professionals from law enforcement authorities, who, in turn, were directed, coordinated, and fully controlled by the organized criminal group. Thus, by serving the “customers” of anti-state activities in pursuit of personal goals, employees of law enforcement and judicial authorities themselves have become complicit in the OCG gang which undermines the economic security, defense and statehood of Russia. So, what kind of fair trial in Russia are we talking about, if the State itself contributes to illegal activities of law enforcement and judiciary bodies? Today’s critical socio-economic situation in Russia is a natural consequence of the activity of the OCG members, who should sit on the dock regardless of their rank, position, and the statute of limitations on their crimes. Because of them, unemployment, poverty and devastation in the country are leading to social tensions, banditry and terrorism. That is why real foreign investors have been so hesitant about investing their capital in the Russian economy, which is so risky from the standpoint of raider attacks. And if the investments still come, it is, to a great extent, merely a return of illegally exported capital which, under the guise of foreign investments, is placed on favorable terms by the “Russian ruling elite” and their “monopoly business partners”. But the “Russian elite” prefers to remain silent about these combinations.